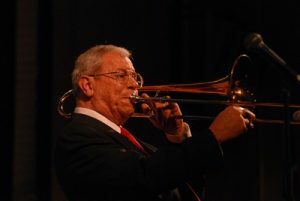 “Big band sounds will fill the Knox County’s Memorial Theater Saturday, April 12, as Mount Vernon’s own Vaughn Wiester brings his Famous Jazz Orchestra home for a forth annual benefit concert for the Community Foundation music scholarship fund established in his honor. Admission to the 7:30 p.m. concert is free to the public on a first-come basis until the auditorium’s capacity is reached. Joining Wiester and his 21-piece ensemble on stage will be vocalist bms. The Community Concerts Association of Knox County and the Community Foundation of Mount Vernon & Knox County are once again co-sponsoring the benefit concert. Congratulations to Chris Hedges, winner of last year’s scholarship award. Wiester’s arrangements can be heard on recordings by Woody Herman, Waldo’s Ragtime Orchestra, the Columbus Jazz Orchestra, and the Keith Henson Octet. His Famous Jazz Orchestra takes it place as one of the recent “Young Blood” big bands on the Columbus scene, performing every Monday at the Clintonville Woman’s Club located at 3951 North High St, Columbus, OH 43214. Sporting a 12-piece brass section (including French horns and tuba), the orchestra’s repertoire is selected from the post-bop libraries of Woody Herman, Count Basie, Stan Kenton, and others. This past February the orchestra celebrated 17 years of continuous operation. Next post: New York Comes To The Bungalow!